The official website of Govardhan Eco Village, A Hare Krishna farm community which is well connected by road from Mumbai. 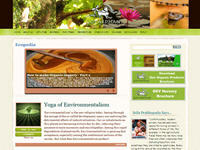 The Site contains articles on Organic farming, Importance of Cow protection, etc. Category Farm Communities June 16, 2012 by ISKCON Desire Tree.